Save time and increase flexibility with Midwest's mobile buffet units. Tables may be fully prepared prior to the event and rolled to the desired location when needed. The detachable riser shelf may be used to add a second tier for buffet setups or to create a mobile bar. 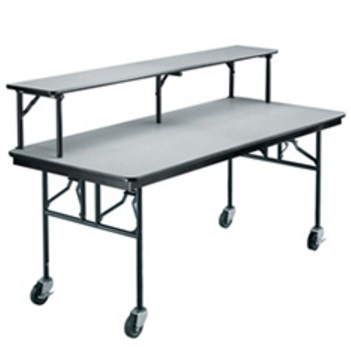 A multitude of uses, ranging from mobile registration tables, mobile demonstration tables, cafeteria room tables, to special event tables make these units ideal for use in any facility. Table folds flat when not in use. Choose between laminate plywood core top with vinyl edge or a sealed plywood top with a steel edge.